Find out if your kid is bullied | Choose the best spy for that! Posted on August 21, 2015 by Tom Richardson Posted in Monitor kids, Phone Spy Apps Blog . Harassment is one of the most unpleasant and even dangerous things that may happen to the kid in the Internet. However, not all the kids are ready to confess to their parents that they are bullied, and not all the parents can notice that something is happening to their child. How to understand that your kid is bullied? There are some signs which show that the kid is harassed. For example, his behavior is changed, he does not want to go to school and wants to study distantly, and kid even starts to fell ill more frequently than before. If you see some of the symptoms, you need to make sure that your kid is not a victim of bullies. 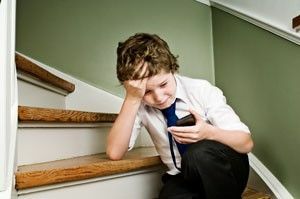 The other effective method to check whether your kid is harassed or not, is to check his messages on the phone. Modern children use slightly different methods for bulling. They prefer to communicate with victim via IM chats, social networks and SMS. Fortunately, to receive access to the child’s phone you do not need to ask for the device itself. It is enough to install tracking software, and receive all the messages that your kid receives and check the contacts that behave incorrectly. What lingo indicates that the kid is bullied? Checking messages that your kid receives and watching thorough the chats at IM and social networks press special attention to such words as fat, fatso, jerk, nerd, freak, ugly and other offensive words. Usually, cyberbullies use these exact words to bully children. Besides, we recommend that you look carefully each dialogue. Sometime cyberbullies harass their victims just trying to make them feel scared. Frequently, such phrases as ‘I will tell your mom’ or ‘Everybody will know about that’ are used. Do not let the cyberbullies offend your kid! You are to use all the available methods to protect your child from the harassments.